Come. Travel with us to the edge of Eureka Springs, a village where endless surprises abound. It is here, just minutes from the heart of downtown that you will find Eureka Sunset Cabins. Look, and you'll see our quaint Cottage Style Rooms, each with its own personal entrance. Our unique designer-quality Cabins, with all of their rustic yet elegant charm, are nestled on six wooded acres right in the village itself. Both our Cabins and Cottage-Style Rooms offer all that you could need to make your stay "the perfect stay". Let your journey for accommodations end here. A placid place to visit... a retreat where you can surrender to the moment before a day of shopping or your evening dinner at one of Eureka Springs' finest restaurants that can be found a mere stone's throw away. Nourish your soul and make memories last a lifetime in our rustic, but elegant cabins, built in such a way that you are high among the treetops giving a "treehouse feel". 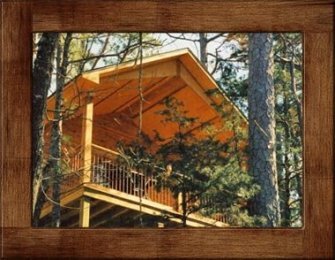 Just minutes from the heart of downtown yet nestled on six wooded acres.... the two are fused at Eureka Sunset Cabins. Fireplaces, Jacuzzis, Dual Shower Heads, King Beds, Full Kitchens, Large Decks and Balconies are some of the many pleasures you will enjoy. Once you arrive, explore the spacious accommodations, beginning with the balconies and decks that allow you to sit out, cook out, and look out into the deep forest beyond. Peaceful privacy is assured as you gather your senses from your long trip, and before you retire to the spacious interior that you'll find delightfully designed with a whimsical attitude. Prices range from $129 to $169 per night for double occupancy. Please view individual cabin and room pages for more information. Read more of our guest's testimonials.